Lenovo might not associate with smartphones, but in reality the company is one of the biggest smartphone makers in China and now it’s jumping right into the high-end with a new Snapdragon 800 based device. Qualcomm’s Snapdragon 800 is even more powerful than the Snapdragon 600, the chip inside the Samsung Galaxy S4 and HTC One. The new device is known as either the Lenovo K6 or Lenovo X910, and it’s just made an unofficial appearance in Chinese forums. The presence of the new Snapdragon MSM8974 chip inside the Lenovo device is confirmed by AnTuTu scores. The device seems to feature a 5-inch 1080 x 1920-pixel display, Adreno 330 graphics which basically fits the definition of a high-end smartphone. Leaksters portray the device as thin and light, and it allegedly feels good in the hand. Finally, we should mention that the Lenovo K6 or X910 is not likely to come to the United States. Lenovo is big in China and that’s its main market for this handset. "Looks like a pretty generic design," I thought to myself. I don't mind that at all, it does have a appeal to it, almost masculine. You have a good point, but personally speaking I already have a phone which is everything I need it to be....and that's the Lumia 925. Am I being a bit fussy here, but what is the point in this article if China is going to be the only place which will ever see this phone? Because people from around the world read this site, and there are those of us interested in tech in general - what other countries are using, getting.. etc. 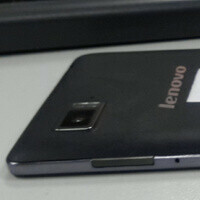 I like lenovo because they have different variety of phone from low to high. The only bad is that they dont update and they are kinda new player making phone so there will be some bugs specially they have chinese characters. lenovo doesn´t have luck in europe. High end spec but hardly anyone has got their handset.